Yes I'll say it, there really is nothing better than a strong cup of iced coffee. Until a few months ago I thought the only way for a cup of iced coffee to exist was to brew up some, cool it down, and drink it. Boy, was I wrong! The cold brew method truly is the only way to make iced coffee. I've searched the internet for many variations on the iced coffee method, and used the pioneer woman's recipes for quite awhile, but find making an entire pounds worth of coffee at one time a little excessive, the container barely fits into my fridge. Take all the ingredients into a large glass picture (Quart sized mason jar works well) and stir well. Cover and place in the fridge overnight. 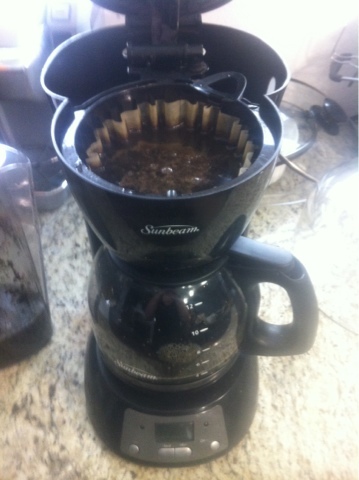 The next morning strain through a mesh strainer or even the coffee filter in a coffee pot (like I did) and refrigerate in the same (cleaned) glass container. 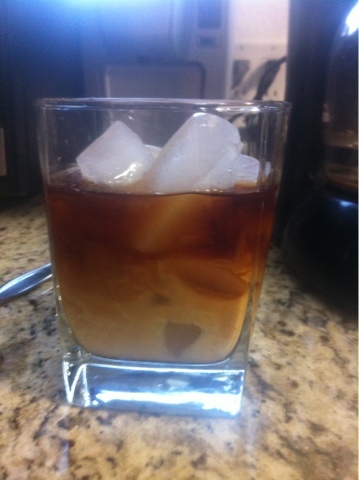 When ready to drink, fill a glass with ice, pour 2/3 full of coffee and then top off with half and half. If you are crazy like me, you'll skip the brown sugar part (but keep the cinnamon) and just add about 1 tablespoon half and half and one tablespoon sweetened condensed milk (the milk of the gods if you didn't know, a tip from the pioneer woman) and stir together for what is called a Thai iced coffee. Delish!